The team at Engel & Völkers Southern Africa knows how to work hard as well as how to let their hair down and celebrate their success. This year's Annual Rewards and Recognition (R&R) function was held in the beautiful Stellenbosch Winelands amongst the Vineyards. 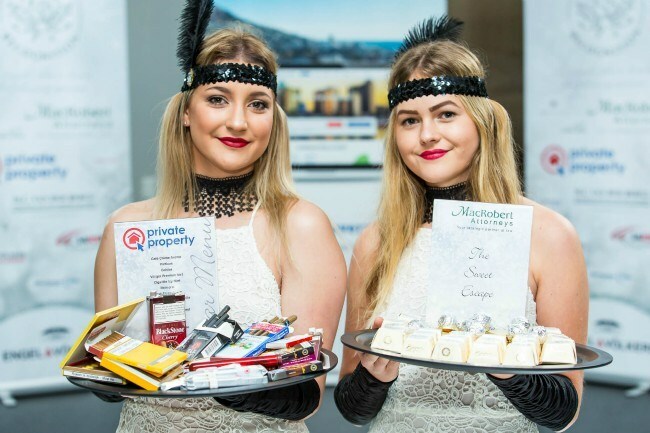 On 20 April over 150 Real Estate Agents, Licence Partners and Assistants, came together in Stellenbosch for their rewards function, with this year’s theme depicted the company ethos with elegance and in their corporate colour of white. The R&R is a special evening where the team from the E&V Master Licence recognise the achievements of the most successful employees of the past year. It also creates a platform where guests can enjoy the networking amongst their peers, and teams can come together and strengthen their relationships within their shops. The eventful day started off with the Licence Partner conference at the Devonvale Wine & Golf Estate, providing a wonderful setting for the 40 participants in attendance. The main topic of the agenda was recruitment. “Visibility and recruitment will be key to unlock success in 2018, with the help of EV Training Academy, the focus will be shifted from quantity to absolute quality in recruits” stated Lara Machado, Head of SA Academy & Operations Manager of Engel & Völkers Southern Africa. Simone Soltau, Head of International Franchise & Business Performance, representing the Hamburg Engel & Völkers headquarters also attended and shared her knowledge on the topic. Real estate property brokerage is often overlooked as a credible and lucrative career, which is changing rapidly as Engel & Völkers is at the forefront of driving this change through their international system and training programme. As the sun started to set over the vineyards the time came for all the Licence Partners, Agents and Assistants to be recognized, acknowledged and celebrated at the Rewards & Recognition Function at the beautiful Landtscap venue, a modern location set amid the Cape Winelands. As the guests made their way along the red carpet, they were welcomed by the AffodizzyActs violinist who set the mood for the evening. Guests gathered on the deck where they were able to enjoy the not only delicious, but stunningly bottled Carol Boyes wines and Craft beer sponsored by SARRPS IT Services, while mingling and admiring the panoramic views. While waiting for the main festivities to begin the MC van der Berg Attorney Oyster King and Sushi Queen kept guests entrained, serving bites of pure delight. As soon as everybody arrived, it was time to settle down as starters were served whilst guests were welcomed and given a run through of the evening’s proceedings, after which everyone could roam and network at their leisure with some more surprises underway with a cigar tray from Private Property and a chocolatier from MacRobert Attorneys doing the rounds. Once dinner services completed, it was time to start the formalities of the evening. Awards were given in the categories such as “Money Maker of the Year”, “Team Leader of the Year”, “Brand Ambassador”, “CI Shop of the Year” and “Agent of the Year” for each region. Greg Crowder from Private Property also presented the Private Property Individual Online Excellence award to Jürgen Schreck from Potchefstroom, and the Centurion Office walked away as the Top Supporting Office. “We congratulate all the winners, and know that their successes are a great inspiration to the rest of the agents, I am extremely proud of the achievements of everyone within the Engel & Völkers Southern Africa family,” proudly noted Craig Hutchison, CEO Engel & Völkers Southern Africa. As the awards section drew to a close, it was time for the celebrations and party to begin. It got off to a spectacular start with a fibre optic whip dance act, followed by DJ Nic made possible by Mortgage Max, who created the perfect atmosphere for all those wishing to have some fun on the dance floor, which proceeded till the early hours of the morning. Engel & Völkers Southern Africa wishes to thank you to all their partners who formed part of the event for their kind contributions, making an evening such as this possible. RE/MAX of Southern Africa currently ranks as the number one real estate brand in the country based on number of listings.